1. 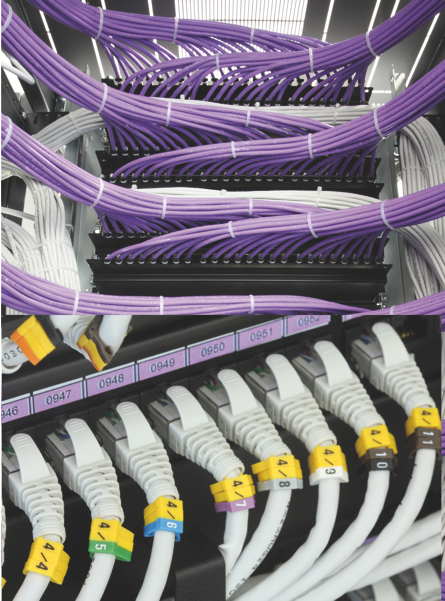 Optimizing the distribution of cabling in raised floor, environment and inside the rack: Improper wiring channeling is one of the typical problems that we face in the CPD and can eventually lead to true headaches when proper operation of the HVAC system. We must make a good design of the layout of the trays, cable harnesses out in an orderly manner and if possible, make paths below hot aisles and parallel to them. 2. Placing blanking panels in areas of untapped racks. Further actions of low cost and considerable benefits is installing blanking panels in the front and rear racks for those heights where no server is loaded . This action accomplishes that by-pass flows inside the rack are minimized, taking advantage of as much of the flow handled by the server in the cooling. Also prevent bypass air from the hot aisle and cold aisle, with the loss of efficiency that it would cause. 3. Proper placement of grilles in raised floor, perforated plates or areas of communication between the raised floor and the front of the cabinets: a study is needed to allow us to obtain a predicted dissipation per rack that we will have in our datacenter. If this is working, it is advisable to make the necessary measurements using temperature probes to check the operating conditions of each cabinet and thus solve the problems of the hot spots by a greater contribution of airflow. This study can be done by any computational fluid dynamics program to simulate the behavior of the data center both in the case of the same design as for the study of any modification to raise. 4. Sealing the entire volume of datacenter. Perform proper sealing of datacenter will result in lower energy losses by leakage of air treated, greater impermeability, better security against moisture and detection / extinction of fire by gases and globally higher structural reliability for the entire dtacenter. It is therefore a feature not only desirable but required for a datacenter and so reflects the TIA-942 regutation. 5. Correct location of CRAC units Poor location of air conditioning units can cause defects in the diffusion of air in the room and therefore temperature difference between ‘hot spots’ areas, plus another type of energy losses that will result in a higher total energy consumption. To avoid these phenomena, we must locate the CRAC units in the periphery of the data processing center and if possible in the hot aisles, preventing reated air recirculation returned to the unit and facilitating the false floor has a more homogeneous characteristics. 6. Creating a configuration of cold / hot aisle: The distribution of hot and cold aisles is to align the rack cabinets in rows orienting racks front and rear with front to rear so that corridors which absorb racks are created by its front cold air (cold aisle) and corridors to which rejected racks driving hot air (hot aisle), after cooling the servers. This configuration allows a better use of space because you can assemble the racks, increasing the density of them in the room. It also reduces the current by-pass hot and cold air that occur if the racks are physically separated, so we have a better use of refrigerated air and finally to allow the hot aisles return hot air at a higher temperature to CRAC units efficiency is improved, thereby decreasing the power consumption associated therewith. These key actions have a direct influence on the energy efficiency of your datacenter. If you need a detailed study, please contact us.